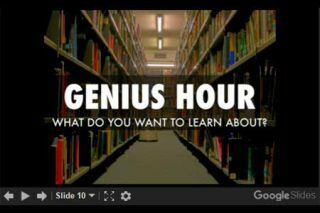 This year, my English 10 students and I took a new approach to #GeniusHour. We focused our student through the lens of the English classroom with #GenreGenius, a deep dive into literary study. Students chose genres to investigate, learned about tropes and origins, read a lot, and did something. Learn more about our work at geniushour.aschoenbart.com or past #Schoenblog posts here. I love that we’ve focused the open exploration and passion-based learning of #GeniusHour through our class content; it’s made our study more unique to English and a little more special. Since students are already investigating their own interests by conducting formal research in our school’s Capstone program, it was a welcome shift. We can apply the same skills and fundamental philosophy of learning in a new way. Still, there’s a lot I missed about our traditional #GeniusHour. Mistakes were made. Let me be clear: these are mistakes in instructional design, the kind that we all probably make when trying something new for the first time. My complaints aren’t with my wonderful students, but with myself. They come from the privilege of 20/20 hindsight. Now that we’re at the end of the project, it’s easy to look back and reflect. My students read a lot. They read things they might never have outside of our class. They enjoyed it--I think--and they did great things with their learning. I don’t regret any of that. But here are four important aspects of #GeniusHour where I made mistakes or where I felt like we missed out on opportunities. These are things I want to do better to help my students continue to do better, too. In #GeniusHour, my students learned to conduct their own action research as a part of their work. Almost every student did so successfully with interesting surveys, interviews, and artifact studies. I even wrote about the value of teaching students to conduct action research in Teaching Students to Conduct Action Research. But I didn’t focus on it in #GenreGenius because it didn’t feel as authentic to literary analysis and genre study. But in retrospect, I was wrong. One student chose to survey classmates about how science fiction impacted the way they think about the world, and it was an awesome compliment to her own reading and analysis. I didn’t know much I missed this component of #GeniusHour projects past until I saw it again this year. With high school sophomores, I wanted my students to have complete control over their reading and story consumption. As long as they found a range of long, short, media, and informational texts, the choice was up to them. I didn’t focus on the quality of the texts as much as maybe I should have. We didn’t use research databases specifically because it was a skill they had already mastered. Instead, I focused on passion and freedom. But I think I missed an opportunity to teach my students to become critics. I wish we had taken the time to read some genre criticism so that students could develop an informed stance on the genre. They all leaned about genre history, influences, tropes, and seminal works, but I wish there was a more argumentative and critical lens to it all. The need for more synthesis is a longstanding area for improvement in #GeniusHour for my work. I explored it most recently in 5 Ways I Want to Improve #GeniusHour. Last year, some of my students’ projects felt too disjointed and lacked a synthesis of ideas and research. This year, though, the research was more foundational. It was the reading that inspired the creation, for the most part. To that end, most projects didn’t have actual citations because they helped develop thinking, not provide quotes or ideas. Students made those references in synthesis blog posts, exploring the genre’s impact by discussing all of the works they read or watched. I wish we did more here, too, and really dove into synthesis writing. It was a great opportunity to further develop an important skill by bringing together all of the reading and sources to create new meaning. We do this with the NYS Regents argument essay and other work throughout the year, and it was an obvious missed point here. Despite last year’s successes with Twitter, I didn’t pursue it as much with my students this year. My freshmen needed more scaffolding and my sophomores seemed disinterested; I don’t like these excuses but they led to a more passive push of social media in my classroom this year. That’s a topic that definitely deserves another blog post. Still, we commented on each other’s blogs and shared them with the world. I Tweeted students work and we we got some comments and feedback. But without making authentic audiences and social media an important part of our learning throughout the year, the audience for blogging and projects didn’t have the same payoff. My students’ work was great, overall, but many had trouble making the authentic audience connection. I miss the way that social media helped my students grow and connect last year, and regret not revisiting it more this year. I framed this articles as mistakes, but really they are learning opportunities. I chose not to address these four ideas as much this year because my students were getting those skills in other ways. In fact, I’m working with a team to implement many of these skills in the school’s Capstone program to great success. So maybe my mistakes or missed opportunities are really my own nostalgia. Maybe I’m just missing these elements from my classroom--it’s bittersweet when I don’t need to teach a skill because my students are coming in with stronger skills and knowledge every year. And those are all good things. Things that I’m proud of. While I’m reflective and a little critical, I can’t help but look at the outcomes of #GenreGenius and see passion, engagement, and innovation. My students have studied a dozen different genres and produced videos, plays, satires, interactive maps, and so much more. And those are just the things I’ll be sharing in coming weeks. We will explore some of the #GenreGenius projects, student reflections, and goals for next year. Stay tuned. How has the end of the year helped you reflect? What missed opportunities can you learn from for next time? Please share your thoughts in the comments or on Twitter @MrSchoenbart.